The writer is David Giffin, a Masters in Theological Studies student at the Candler School of Theology at Emory University in Atlanta, GA., writing at The College Conservative. You can follow him on Twitter @D_Giffin. For those who read other reviews and may have been lead to believe that the film was made by amateurs, I ask that you kindly check your preconceptions at the door. From the very first minute of 2016 onward, the documentary features some very high production value and clean, professional quality. (Gerald Molen wouldn’t produce just anything, after all.) Using frequent flashbacks, map imagery, and the use of old photography effects, the movie seeks to pull the audience members in and connect them with the people, places, events, and ideas that play such a major role in President Obama’s history…. The film goes into some depth by utilizing a wide range of interviews. Key to Dinesh’s argument is the life of Barack Obama Sr., the Kenyan anti-colonialist who he claims was key to shaping the worldview of his son, the young Barack Obama. Dinesh effectively reinforces his claims about Obama Sr. with interviews from several of his friends and family still living and residing in Kenya…. 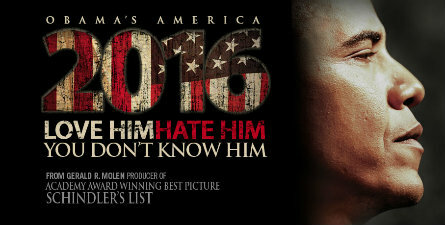 The final part of the film gives a brief overview of how the anti-colonialist ideology may play a major role if President Obama is elected to a second term. This part of the film was quite honestly the scariest, as the theories put forward by Dinesh and his interview subjects paint a very dark picture. Dinesh argues that if Barack Obama truly believes that America would be better not as a superpower, but as one nation among many leading powers, then many of his policy moves from his first term would only be pushed to their natural extremes…. The final message that Dinesh wants viewers to take away is made very clear at the end of the film: if the history of Barack Obama and his anti-colonialist philosophy are in fact what is driving his policy decisions, then a second term would be a very bad idea indeed…. You can read more about the film over at Legal Insurrection.